Chicken eye problems do seem to occur in backyard flocks frequently. There are many different types of eye problems. In healthy chickens, vision is excellent during day light hours and extremely poor at night. The average chicken is able to see the smallest seeds and bugs, including mites, during the day, but as the sun begins setting, their vision becomes unreliable, causing them to head to the safety of their roost for the night. Chickens rarely attack each other in such a way to cause chicken eye problems, but roosters jabbing at each other with their sharp spurs or pecking with sharp beaks may do serious damage to any body part. Hens are less likely to fight, but it happens. In a chicken flock, when a member becomes sick, weak or injured, other flock members out of curiosity or survival instincts may peck mercilessly at it, causing more damage, and possible death. Unsuccessful predator attacks may result in eye damage. An example of on one chicken eye problem is Avian Pox. It is a viral disease that affects many chickens and can affect and be spread by wild bird populations. Blistery lesions are often around the eyes causing swelling with impairment of sight and blindness in severe cases. Marek's Disease is a viral disease (a form of herpes virus) resulting in a type of cancer. Tumors can grow in the iris causing blindness as well as affecting major organs. When you first notice an eye problem you should wash the eyes out. Keeping an eye wash on hand is a good idea; something that can easily be squirted into the eye to remove any foreign particles and reveal any damage. A chicken with impaired vision due to injury or disease should be immediately removed from the flock to protect it and possibly prevent the spread of disease. Chickens know that the sick and weak draw attention to predators, so they try to drive the weaker members away from the flock. In the process they do more damage, exposing themselves to a possibly contagious disease. If you aren’t familiar with chicken diseases or find a chicken eye problem with an unknown cause, you might want the help of a good avian vet. In the country, where chickens are much more popular, you may be able to find a good farm vet through neighbors or friends. Finding one before you have a problem is always a good plan. The reality is that many sick chickens will never see a vet as their monetary value makes spending $50 to $100 or more unreasonable. But the fact is, even with a small flock, you could lose all due to a contagious disease, plus have a coop and yard that may need months of being empty to make sure disease is gone. Some chicken eye problems are simple to fix and heal quickly while others are caused by serious disease. Making sure which one you have may save the lives of all your current and future chickens. If you do have a major disease there may be a vaccination against it. You may need to purchase pre-vaccinated replacement stock to survive in a yard and coop possibly contaminated with disease. Learning what disease it is, from a vet able to test will be a good step in getting rid of it for good. 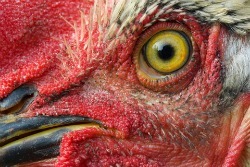 The eye is a delicate and vital part of a chicken’s ability to remain healthy and active. Their sense of smell is poor, as with most avian species. Once vision is lost or severely impaired a chicken has little hope for survival; eating, finding water and roosting will be impossible. It’s unrealistic to expect one with serious chicken eye problems to do well in a flock setting, though chickens with one good eye seem to adapt. Even still, such a handicapped chicken could be expected to be picked on and bullied by other members of the flock. Being allowed access to enough food by the rest of the flock is not guaranteed, so making sure a partially blind chicken isn’t slowly starving to death is important. WHAT COULD CAUSE TEARY CHICK EYES? what can I do for the chick when both eyes are watering and she seems to be in pain?